"Una red para académicos, empleados y estudiantes latinos"
To receive our weekly newsletter with relevant and local events, activities, and announcements, please sign up using our online form, or email us at muvozlatina@missouri.edu. Para recibir nuestro boletín semanal con eventos, actividades, y oportunidades, suscríbase con el formulario en línea o mandé un correo al muvozlatina@missouri.edu. Meet our Board of Directors! ¡Conozca la Junta Directiva! See the Latinx Heritage Month at Mizzou 2018 calendar of events. Monthly Pizza Parties! "Hora Social Con Pizza"
Voz Latina has organized a display at Columbia City Hall to show some of Latin America's heritage, including typical clothing, art, crafts and other objects. See the beautiful display of pride in our heritage Sept 15- Oct 15, 2018 at 701 E Broadway. Open to MU faculty, staff, students, and the Columbia community. MU Voz Latina will provide a main dish. Please bring a side dish from your country, region, or culture. Music, dancing, games, speakers, and activities for adults and children. Sponsored by MU Voz Latina. Share flyer. Join us in learning directly from Fermina, an Indigenous Mixteca farmer from Oaxaca, Mexico. Fermina has been part of the technical team of the Center for Integral Small Farmer Development in the Mixteca (CEDICAM) for 14 years. She works to promote soil conservation, reforestation of native trees, rainwater collection, conservation of native seeds and food production, whiel promoting the importance of conserving a local food culture that includes products grown in the milpa system. See flyer. 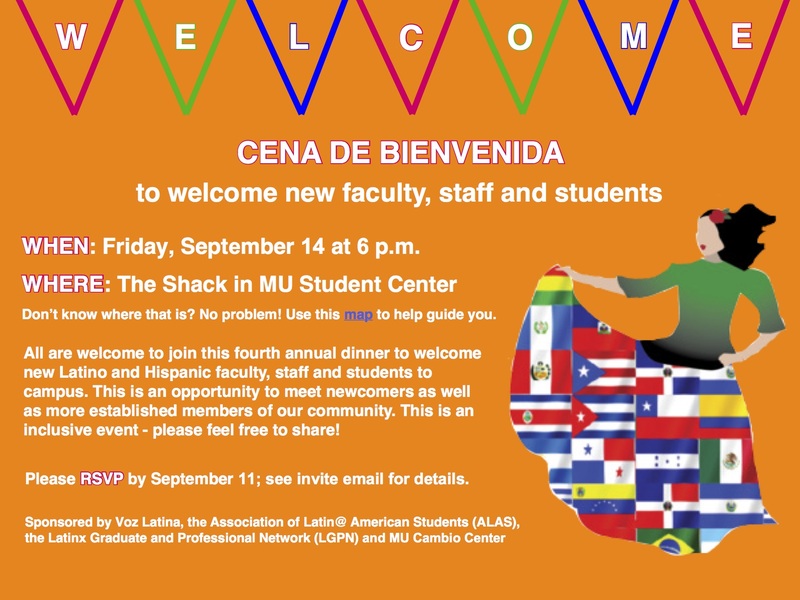 Cena de Bienvenida/Welcome Dinner to new faculty and staff: Friday, September 14, 2018, at 6pm in The Shack in the MU Student Center. All are welcome to join this fourth annual dinner to welcome new Latino and Hispanic faculty, staff and students to campus. This is an opportunity to meet newcomers as well as more established members of our community. This is an inclusive event – family and friends are invited; please feel free to share! 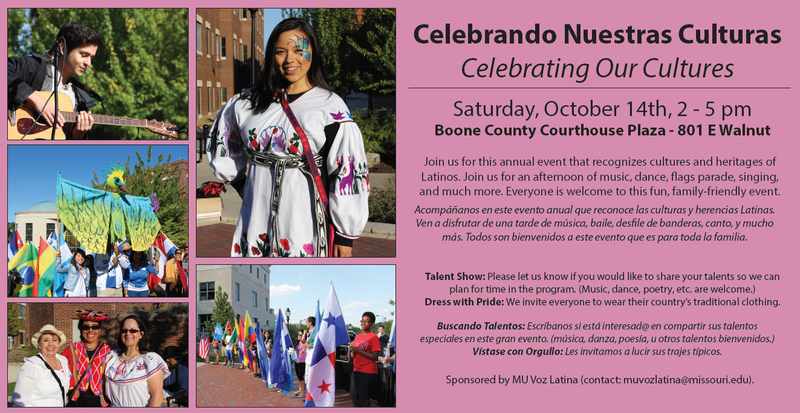 RSVP required by 9/10 by emailing us at muvozlatina@missouri.edu. See the 2017 Latin@ Heritage Celebration calendar. Join us for this annual event that recognizes cultures and heritages of Latinos. Join us for an afternoon of music, dance, flags parade, singing, and much more. Everyone is welcome to this fun, family-friendly event. Dress with Pride: We invite everyone to wear their country’s traditional clothing. Acompáñanos en este evento anual que reconoce las culturas y herencias Latinas. Ven a disfrutar de una tarde de música, baile, desfile de banderas, canto, y mucho más. Todos son bienvenidos a este evento que es para toda la familia. Vístase con Orgullo: Les invitamos a lucir sus trajes típicos. Join our Facebook page . Learn about events, activities and other offerings while networking with friends and members. To receive our weekly newsletter with relevant events, announcements, and information, sign up here, or contact muvozlatina@missouri.edu. Archives of newsletters are available here. Suscríbase a nuestro boletín semanal bilingüe. Ver los archivos de boletines. These features acknowledge the academic, professional, and personal successes of Latinos at Mizzou and in our community. Read Spotlight features. Featured in Spring 2017: Melissa Bañuelos, Shirley Rojas Salazar, Alejandra Gudiño, Jessica Bañuelos, Miguel Ayllon, Ana Compain-Romero, Brenda Cortes, Elmer Guardado, Jamille Palacios Rivera, Federico Martinez Garcia, Gabriela Martin, Jose Mejia Guerra, Roxana Avalos, Lina Trigos-Carrillo, Emily Fowler, Jacqueline Gamboa Varela, Denice Adkins, Nathan Cordero, Sarah Buchanan, Sylvia Jauregui, Xiomara Cornejo, Hannia Burke Agüero. Published by MU Voz Latina and the Chancellor's Diversity Initiative — 401 Jesse Hall — Columbia MO 65211 — Phone: 573-882-5838 — E-mail: muvozlatina@missouri.edu Copyright © 2017 — Curators of the University of Missouri. All rights reserved. DMCA and other copyright information. An equal opportunity/affirmative action institution.